TACOMA, Wash.—While on the 2008 campaign trail, Barack Obama vowed to walk a picket line, and defended sit-in strikers at a factory on Chicago’s Northwest Side. Michelle Obama proudly talks of being raised in a union household. But her current book tour for Becoming is another matter, the Theatrical and Stage Employees (IATSE) says. Live Nation, the promoter Michelle Obama hired, in turn, hired a labor law-breaking backstage firm, Rhino Staging, for the former First Lady’s appearances in the Pacific Northwest, and she hasn’t spoken up. That led to an informational IATSE picket line and leafletting when Obama promoted her book on March 24 in Tacoma, Wash.
That’s because Rhino’s workers, citing unsafe working conditions and lack of health insurance, voted to unionize with IATSE Local 15 four years ago. Key issues: Respect on the job and health care coverage. But Rhino, defying National Labor Relations Board orders, refuses to even bargain with the union. 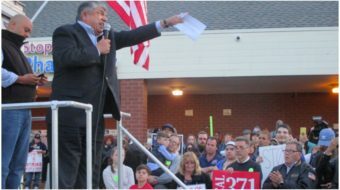 President Barack Obama pushed the Affordable Care Act through Congress – over vicious Republican opposition — almost a decade ago, Local 15 Vice President Bess Sullivan said in a telephone hookup before a pre-picket line press conference on March 22. He also promised the AFL-CIO that if Congress sent him labor law reform, he’d sign it. “We have been supportive of the Obamas” and their policies, especially the ACA, said Sullivan. That leaves her puzzled why Michelle Obama won’t support the workers, especially in their quest for the union and for health care coverage. 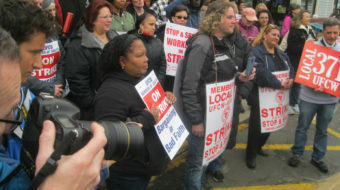 “Our workers need their health care,” Sullivan said. After all, setting up and rigging a stage can be dangerous if there’s a lack of safety harnesses and guardrails. “That’s why we’re appalled Michelle Obama hasn’t replied,” to IATSE’s requests for her to intervene and order her subcontractor to bargain with the union, Sullivan says. Rigging – lugging hundreds of pounds of equipment up scaffolding and so on – is hard. It also can be dangerous. The Seattle Weekly dug up records showing poorly trained Rhino rigger Vicente Rodriguez fell 40 feet to his death during a Tom Jones concert in Las Vegas a decade ago. Nevada’s Occupational Safety and Health Administration found Rhino hadn’t trained him on how to properly put on his harness. It fined Rhino $4,000. Rhino’s refusal to recognize and bargain with the workers and Local 15, over health care coverage or anything else, breaks labor law. It also led the workers to stage the informational picketing in Tacoma, after repeated union requests to Obama to speak up for workers went unanswered. “Rhino Staging Northwest has personnel policies and operations which are not consistent with the values you have represented throughout your career,” IATSE President Matthew Loeb wrote to Obama on Jan. 23. 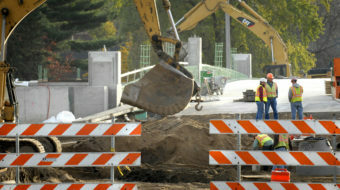 The union also contacted her office and reached out to her associates several times over the last eight weeks. 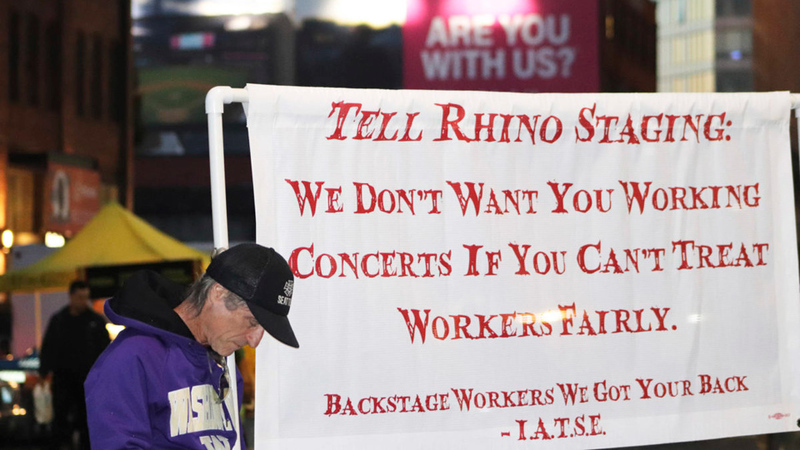 IATSE asked Obama to “consider having a discussion with Live Nation and the Tacoma Dome” to advocate for Rhino workers so “workers would have fair treatment during her appearance in Tacoma.” Loeb, too, got no reply. The informational picketing of Obama’s book tour in Tacoma, and the press conference before it in Seattle, was not the first time Local 15 and its union backers have taken to the streets at a high-profile event to publicize their problems with Rhino. 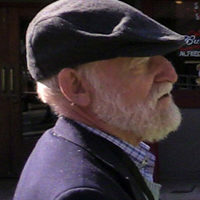 They previously leafleted and staged informational picketing for music lovers at a Beyoncé concert in Tacoma, as well as at other events around the Pacific Northwest, featuring Def Leopard, Fleetwood Mac, and other performers.